After Ahvaz, what is next for Iran? Repercussions from the terrorist assault in the southwestern Iranian city of Ahvaz that left at least 25 dead continue to reverberate regionally and internationally. 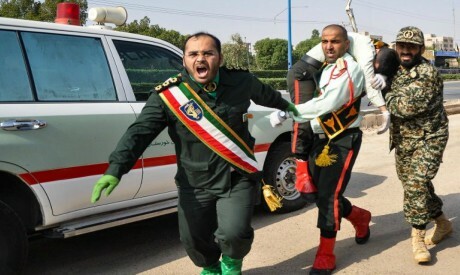 Two days after the incident, Iranian Minister of Intelligence Mahmoud Alavi announced that a “large part of the network” responsible for the attack on a military parade in Ahvaz had been apprehended. Other Iranian officials exported the crisis, hurling accusations against the US, Israel and Gulf countries for being behind the attack. Iranian President Hassan Rouhani lashed out at Washington for attempting to stir sedition and disrupt security in Iran and he accused a number of regional powers of furnishing military and financial support to separatist movement Al-Ahvaziya. Acting commander of the Revolutionary Guards General Hussein Salami vowed revenge against the “triangle” of Saudi Arabia, Israel and the United States which he blamed for the attack. “You have seen our revenge before ... You will see that our response will be crushing and devastating and you will regret what you have done,” Salami said in a televised speech broadcast live. Replying to Iranian charges of US involvement, US Secretary of State Mike Pompeo said that it would be wrong for Tehran to look for responsibility abroad for the attack. Despite the mounting tensions between Tehran and Washington since the latter withdrew from the Iranian nuclear accord, President Donald Trump has indicated his readiness to speak with Iranian President Hassan Rouhani without preconditions, and whenever the Iranians want. The US president’s remarks gave the impression that it was Tehran that asked for a meeting, but Iranian Foreign Ministry Spokesman Bahram Ghassemi denied that his country had made such a request. In an interview on the NBC programme, “Meet the Press,” Pompeo reiterated Trump’s willingness to meet with Rouhani. “He’s happy to talk with folks at any time. The president’s been pretty clear about that,” Pompeo said, adding that the onus was now on Rouhani to reach out. Ghassemi had criticised Emirate intellectual Abdel-Khalek Abdullah for remarks he described as “idiotic.” Abdullah had reposted a tweet by Saudi Crown Prince Mohamed bin Salman about moving the battle to inside Iran and then commented, “a military attack against a military target is not a terror act. The Islamic State group claimed responsibility for the attack in Ahvaz. The organisation’s Amaq news website broadcasted a video recording of three men in a vehicle, claiming to be on their way to carry out an attack against the military parade in Iran. Two spoke in Arabic and the third in Persian. They said they were going to kill Iranian Revolutionary Guards. However, Iranian Military Spokesman Brigadier General Abolfazl Shekarchi dismissed the claim and held that the perpetrators of the attack were not from the Islamic State group, but rather were linked to the US, the Israeli Mossad and two countries in the Arab region which he did not mention by name. Ali Bakr, an expert on militant organisations, believes it’s highly unlikely for many reasons that the Islamic State group was responsible for the attack. Noting that one of the most important sources of dispute between IS and Al-Qaeda is that the latter excludes Iran from its targets and has understandings with Tehran whereas IS boasts of targeting affiliates of the Shia faith, Bakr nevertheless stressed that the occasion chosen for the attack was a military display that was held to commemorate a national day, which is to say a secular occasion. He believes that the reason why IS claimed responsibility for the attack was to attract the spotlight. It was a form of publicity that sought to convey the message that IS has the ability to penetrate Iran and carry out terrorist attacks there. Attention also turned to an Iranian-based group called the Arab Struggle Movement for the Liberation of Ahwaz, or Al-Ahvaziya, which claimed responsibility for the attack. He recalled that this group had previously targeted the annual summer camps organised by the Basij, a wing of the Islamic Revolutionary Guards.